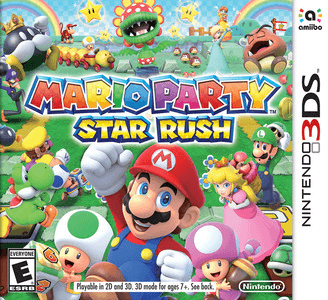 Mario Party: Star Rush is a party video game developed by Nd Cube and published by Nintendo for the Nintendo 3DS. It deviates from the normal Mario Party series in its removal of turn-based gameplay in favor of the ability to move at will, simultaneous with other players, and without set paths on the game board. Mario Party: Star Rush has no graphical or audio issues. The game can run full speed in the main menu and most minigames but may require decent hardware. However, Citra’s networking features don’t work with this game yet. Some minigames require the microphone which isn’t implemented yet, but can be simulated with button inputs as well.